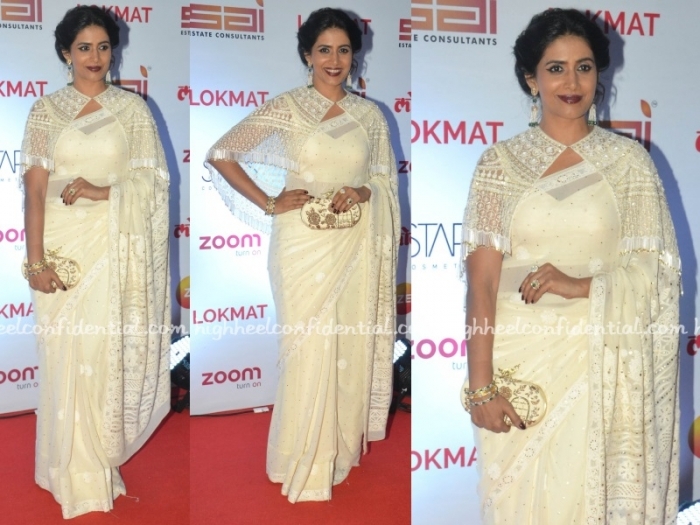 The saree is gorgeous and she wears it really well; but I think she’s wearing too much foundation, which looks cakey. Another one bites the dust in white washed makeup. She has never looked better and sadly for her, her foundation has flashback which looks like she has been whitewashed which happens when you have SPF in it. (? Estee Lauder perhaps? whoever did her makeup did a really good job with matching her shade though). kudos on the improved styling! such a lovely saree. Too much makeup though. Neck down, it’s a hit! make up too harsh for this soft dewy saree with fab delicate embroidery. even the hair could be left long loose flowing.